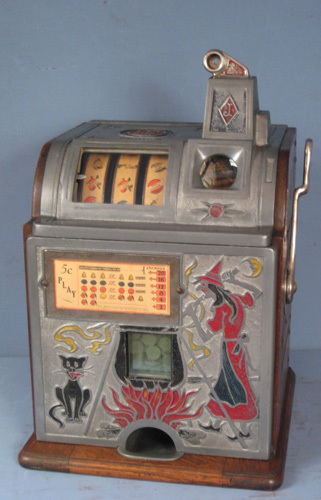 Most collectors have heard of Mr. DeLonge a master carver of characters with antique slot machines incorporated into the bodies. This is some of his unique work. A question when did he do his carvings? We're they for a casino or done on a whim or on a piece by piece order? Are they signed? And are they repoed? I think he is out of Pennsylvania. I don't think they were ever done for casinos. I have seen him selling them at Chicago. I have seen some if his carvings have reproduction machines in them. Rich DeLong he is out of Johsonburgh PA., real nice guy, his web address http://delongslots.com/ he has done many carvings most are made to order, I am not sure on the prices but I assume not cheap, lots of work to carve one out. Thanks I've seen his work at Chicagoland and always wondered about it.